The concept of the nation-state is under assault by the exponents of a one world government. Ruining the essence of any country is the basic objective of the world-wide implementation of imposing a centralized cultural imperative. 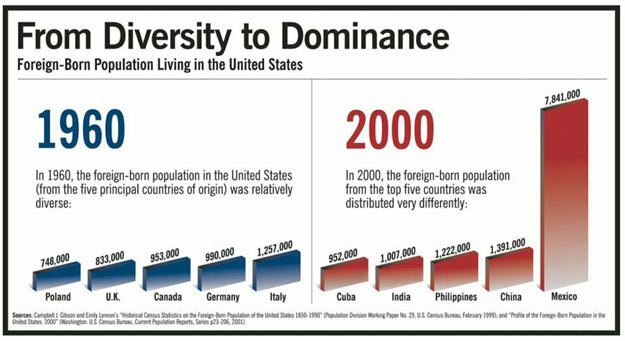 Controlling government immigration policy receives varied national push back depending on the homogeneous character and intensity of each country. By eradicating the indigenous intensity and acceptance of preserving their own culture, the forces of societal purging propose a "PC" replacement merging into a restricted mongrelized jurisdiction. Yet, the complexity of this toxic brew never becomes a melting pot and certainly by no means assimilate into the original value system. When did the political, academic, financial and mass media elites jump off the cliff and betray America? The timing can be argued, but start with The Legacy of the 1965 Immigration Act, which provides a useful resource of the former immigration policies. A brief outline in changes is provided. 1. Unmarried adult sons and daughters of U.S. citizens. 2. Spouses and children and unmarried sons and daughters of permanent resident aliens. 3. Members of the professions and scientists and artists of exceptional ability. 4. Married children of U.S. citizens. 5. Brothers and sisters of U.S. citizens over age twenty-one. 6. Skilled and unskilled workers in occupations for which there is insufficient labor supply. 7. Refugees given conditional entry or adjustment — chiefly people from Communist countries and the Middle East. 8. Applicants not entitled to preceding preferences — i.e., everyone else. As a paleo-conservative a break with our purist libertarian friends over their immigration position rejects their mistaken reliance that an open borders viewpoint is based upon a moral perspective. Actually the correct ethical imperative for any country is to protect the national identity of its citizens and society. That said, even Bryan Caplan acknowledges a crucial aspect in Why Should We Restrict Immigration? Most immigrants come from countries that are less free than the United States. Since even dictatorships are somewhat responsive to public opinion (Caplan 2008), we should expect immigrants to lean statist. Immigrants fleeing domestic repression might hold atypically libertarian views. But economic migrants presumably share the policy outlook of the typical voter from their country of origin. If enough statists come, won’t our democracy switch to the kinds of policies that immigrants struggle to escape? Economists—or at least economists with strong free-market sympathies—would call this a “political externality.” The only way to protect American liberty, you might conclude, is to strictly limit the liberty of foreigners to enter the country. This is probably libertarians’ favorite argument against open borders. My own research confirms many of its underlying assumptions. In The Myth of the Rational Voter (Caplan 2007), I conclude that democracies choose bad policies because bad policies are popular, and bad policies are popular because voters have systematically biased beliefs about their effects. Almost all of my evidence admittedly comes from the United States, where high-quality public opinion data are most abundant. Still, if some countries have worse policies than others, the most plausible explanation is that some electorates are more biased than others. Libertarians seem to face a tragic choice between compromising their principles and retaining the liberty they already have. Conversely, a critique of Samuel P. Huntington in Who Are We? The Challenges to America's National Identity, Charles R. Kesler in CRB cites a Clash of Civilizations theme in another Huntington book. "Of course, despite their protestations, multiculturalists do not actually believe that all cultures are equally valid. With a clear conscience, they condemn and reject anti-multiculturalism, not to mention cultures that treat women, homosexuals, and the environment in ways that Western liberals cannot abide. Unless, perchance, such treatment is handed out by groups hostile to America; for Robert's Rules of Multicultural Order allow peremptory objections against, say, the Catholic Church, that are denied against such as the Taliban. Scratch a multiculturalist, then, and you find a liberal willing to condemn all the usual cultural suspects." The multiculturalists have hijacked the heart strings of the manufactured guilt bleeding apologists, who have more in common with Marxist Dreamers than with our Founding Fathers. They are the most atrocious dissimulators of the true consequences from the barbarians and their fifth column allies for busting our borders. Prolific immigration writer, Frosty Wooldridge pens in the essay, Time to Rescind 1965 Immigration Reform Act, an important assessment that few are willing to face. "Since our leaders won’t stop this invasion of an ‘unarmed army’ of legal and illegal immigrants, it’s up to you. Our children face a dangerous future if we fail to take action. It wasn’t George Washington who beat the British army. It was every militiaman who shot from fence lines and trees. It wasn’t Ike who won WWII. It was every GI who slung a rifle over his soldier. Susan B. Anthony marched and Dr. Martin Luther King demonstrated. They, in their time, paid the price for defending America so we could enjoy our freedom. This is your time. Call for rescinding the 1965 Immigration Reform Act. How should we replace it? Answer: total shutdown of all immigration. We don’t need any more immigrants. We cannot sustain any more immigrants. We won’t survive any more immigrants. Create a national debate in every city council, every community and every state in the nation. Let’s save our country before we won’t be able to save it." It is obvious that Congress will not repeal of the Hart-Celler Act of 1965. Backed by President Lyndon B. Johnson and Senator Ted Kennedy this single law has produced a debauchery that is destroying our nation. So much for the legacy of Senator Philip A. Hart and Representative Emanuel Celler. Promoting a historic national identity places one squarely in the sights of the fake news presstitutes and the social cult warriors, who will bait the public into believing that any defender of the real Patriotic Cause is a bigot, a racist or a neo-Nazi. Nothing is further from the explicit record. The multiculturalists despise the Deplorables because they will not buckle to the forces of national betrayal. Assimilation into our traditional society means that genuine integration requires a basic willingness to BECOME an American and learn what it actually means to be part of this country. Back in 1834, Lyman Beecher, Leader of the Second Great Awakening, on English immigrants wrote: "What means the paying of the passage and emptying out upon our shores such floods of pauper emigrants — the contents of the poor house and the sweepings of the streets? — multiplying tumults and violence, filling our prisons, and crowding our poor-houses, and quadrupling our taxation, and sending annually accumulating thousands to the poll to lay their inexperienced hand upon the helm of our power?" Since that era, the country has changed from European centric which is the indispensable foundation in Western Civilization thought and culture. Today the influxes of third world derelicts are rapidly turning America into failed nation-state. Pat Buchanan has it correct, The Suicide of a Superpower Will America Survive to 2025 is expeditiously approaching.